6 things you must know about the much anticipated redi-GO! Standing out from a crowd isn’t all that easy. The Datsun redi-GO has its work cut out in this aspect, as it enters a segment that is dominated by the Maruti Alto twins. The only other vehicle that has caused a dent in Maruti’s happy universe is Datsun’s own sibling — the Renault Kwid. While the baby hatch wears its sneakers and warms up to have a go at the market, let’s take you through six things you must know about the Datsun. Let’s go… err… redi-GO! The redi-GO is a fairly spacious car for its size. While it isn’t a five-seater, seating four adults isn’t a task. Like most small cars Datsun has scooped out the back of the front seats to liberate that extra bit of knee room. Based on the same CMF-A (Common Module Family) platform as the Renault Kwid, the Datsun has near identical dimensions too. But it has a slightly longer wheelbase and is visibly taller as well. Both these factors help the car be a tad more spacious for the occupants. While it isn’t as funky looking on the inside as its sibling, the redi-GO carries a clean, no-nonsense design. It gets a grey dash that has a splattering of piano black on the centre console. No touchscreen infotainment screen here, just a good old music player. The redi-GO borrows the 800cc motor from the Kwid that develops 54PS of power and 72Nm of torque. Mileage figures are identical, rated at 25.17km/l. The Kwid will get a larger, 1.0-litre motor paired to an automated manual transmission (AMT) soon. It remains to be seen if the Datsun gets it as well. 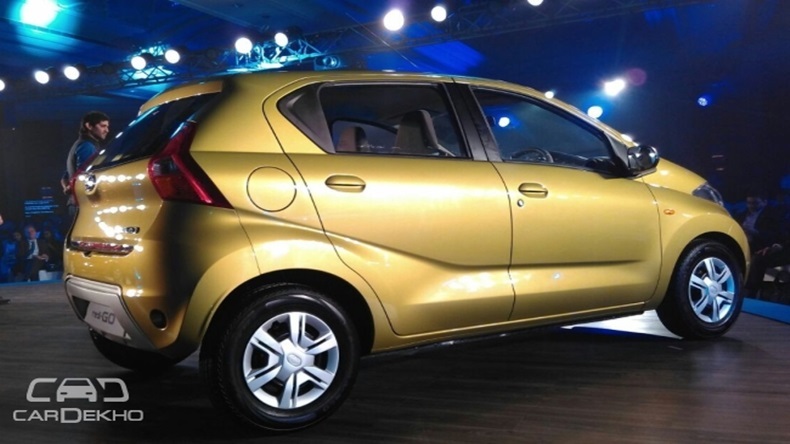 Datsun has confirmed that the redi-GO will be priced between Rs 2.5 and 3.5 lakh. It will undercut the Kwid’s price and be the cheapest Datsun on sale in India. Pre-launch bookings are already underway at Datsun dealerships across the country. The hatchback will be officially launched in the first week of June. That’s all you need to know about the upcoming Datsun redi-GO. Do stay tuned for our in-depth first drive impressions, coming soon. While we work on the review report, let us know what you think of the hatchback. Will it be able to replicate the Kwid’s success?